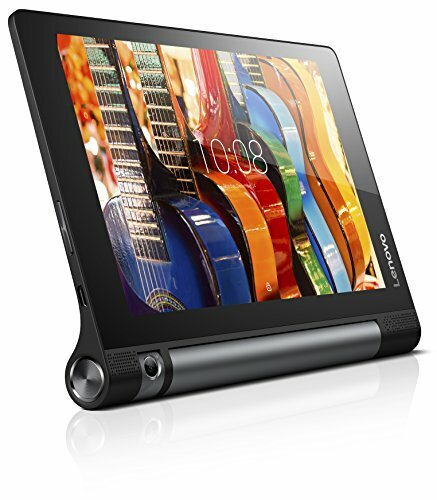 The Lenovo 8" Yoga Tab 3 16GB Tablet is powered by a 1.3 GHz ARM Cortex-A7 quad-core processor and 2GB of LPDDR3 memory to deliver performance for web browsing, watching online videos, and more. The Yoga Tab 3 comes equipped with 16GB of internal storage along with a microSDXC card slot that can accept memory cards up to 128GB in capacity to expand its digital storage space. For visuals, Lenovo's Yoga Tab 3 uses an Adreno 304 graphics chip to drive its 8" display, which has a resolution of 1280 x 800 and a brightness level of 400 cd/m2. There's also an integrated kickstand that props up the tablet vertically, so you can enjoy movies and TV shows without using an optional stand or case.